Even if you don’t consider yourself skilled in the cooking department, there’s something so sweet and intimate about cooking dinner with someone. 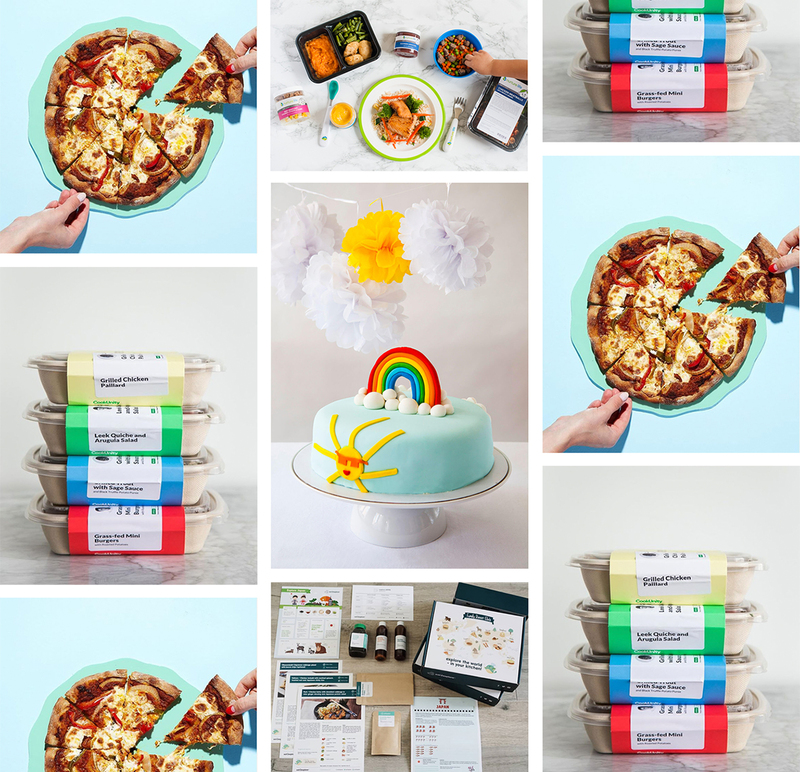 Whether it’s with a date, significant other, friend, or family member, cooking together is a great way to be creative, learn together, and bond over a common activity. Dating someone new? Following a recipe together is a great way to break the ice. Been with someone for a long time? Cooking is a great way to work together and have time away from the other things going on in life. 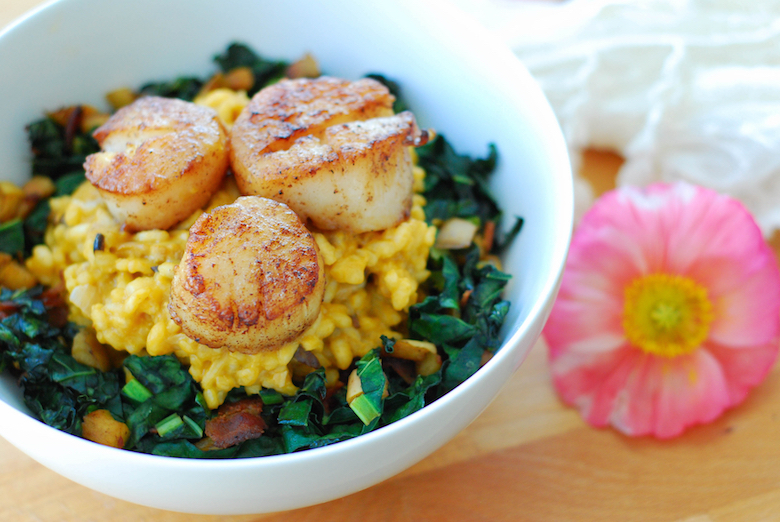 Risotto is a perfect meal to cook on Valentine’s Day. It feels special and upscale, while being fairly simple to execute. The risotto needs to be attended to and stirred often, giving you both an excuse to stand together near the stove, stirring, chopping, and sipping wine while you talk. There are also a few other components to this dish (scallops and sauteed kale), so you both have jobs in the kitchen. 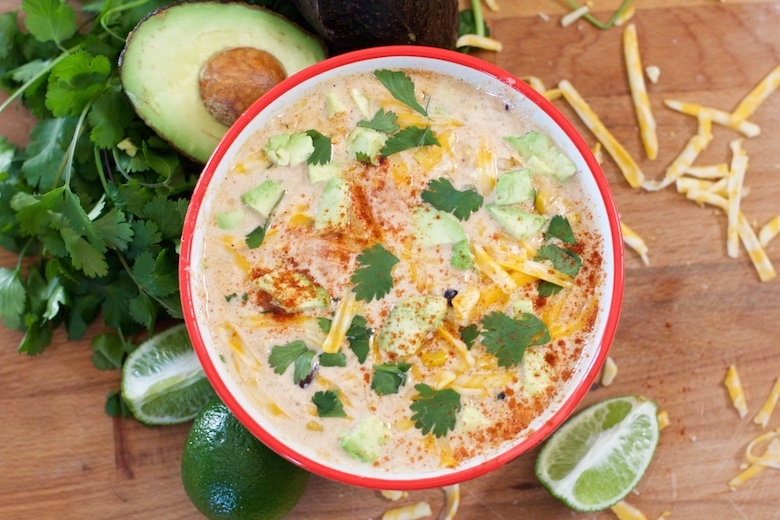 I find the process of cooking this dish just as enjoyable as eating it! I made this dish without cheese, but it would be excellent with some Parmigiano-Reggiano. Be sure to purchase dry-packed scallops (not wet-packed) to ensure a nice caramelization on both sides. 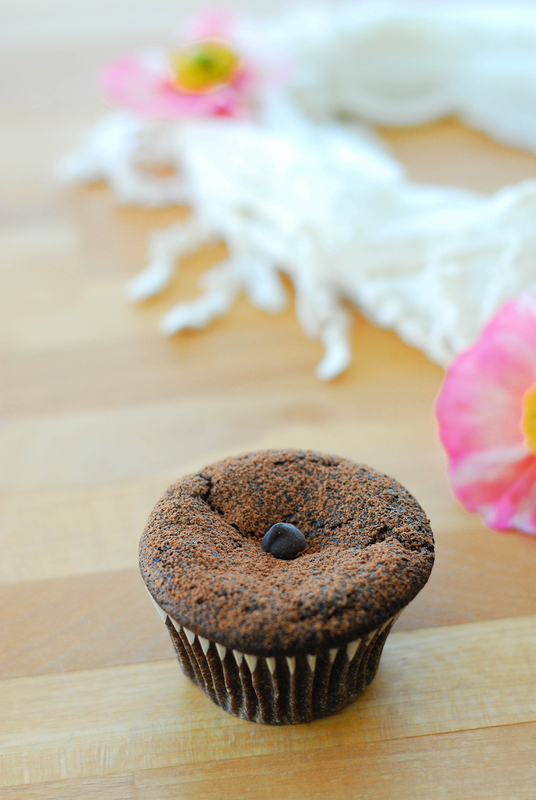 I’ve also included a dessert recipe for super chocolately flourless muffins! They would be excellent with a buttercream frosting. Also – just how gorgeous are poppies? I’m not really a flower girl, but give me poppies and peonies over roses any day! You’ve heard it here, guys! Chop the onion finely and separate into two ½ cup portions. In a large skillet, heat 1 Tbsp. butter over medium heat and add ½ cup of the onion. Stir often and reduce the heat down to low. When the onions begin to brown, add the shiitake mushrooms. Stir occasionally until the onions are caramelized and the mushrooms are soft, about 5 minutes. Sprinkle the onions and mushrooms with salt, then remove them from the pan and set aside. Heat another 1 Tbsp. of butter over medium heat and saute the remaining onions for about 5 minutes, until the onions brown. Warm the stock in a small pot over medium low heat until just warm and set aside. Add the rice to the pan with the onions and allow the rice to toast for about 1 minute, until the onions and rice are well combined. Add ½ cup of the stock and stir with a spoon until the stock begins to bubble, then reduce the heat to medium heat. Continue stirring until nearly all of the stock has been absorbed by the rice. Continue adding ½ cup of stock to the rice in this fashion until all of the stock has been added and the rice is creamy and plump, which will take about 20 minutes. Stir in the mushroom and onion mixture. If the risotto still looks a bit dry, add a little more stock (or water), in small amounts until it reaches the desired consistency. Remove the pan from the heat and stir in 1 tablespoon of butter and the cheese if you are using it. Remove the side muscle from the scallops, and lay the scallops in a single layer between two pieces of paper towel to ensure they are dried. Season both sides with salt and pepper. In a small pan, heat 1 Tbsp. of butter over medium high heat. Once the butter is melted, add the smashed garlic and swirl until the garlic begins to brown. Blot the scallops dry with a paper towel once more and lay the scallops in the pan one by one. Cook the scallops for 1-2 minutes on each side, being careful not to overcook them. Set aside. Chop the bacon, apple, and kale into small pieces. Heat the bacon in a skillet over medium heat, stirring occasionally until the fat begins rendering. Add the apple to the pan and stir with a spoon. Once the bacon begins to brown and the apple softens, add the kale and saute over medium or medium high heat until the kale is just wilted. 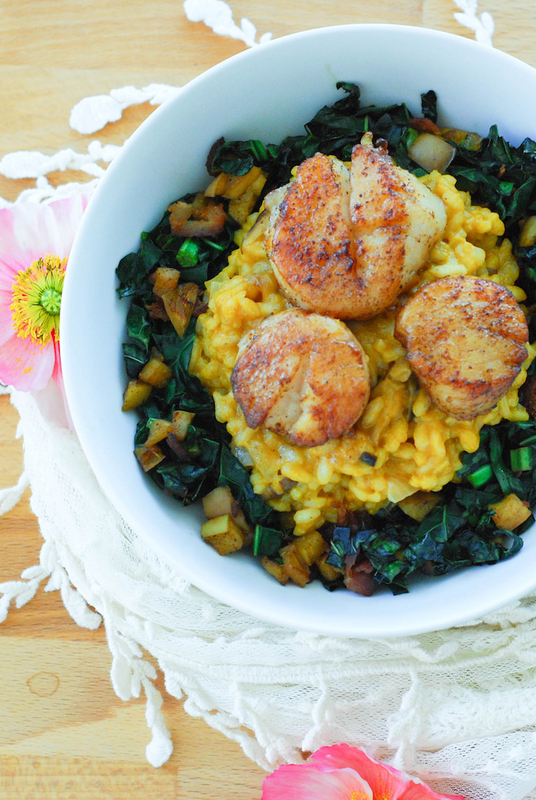 Plate the scallops and risotto over the kale mixture and enjoy! Preheat the oven to 350 degrees. Mix the coconut oil, sweeteners, vanilla, coffee, salt, liquid and cocoa powder together in a bowl until well incorporated. In a separate smaller bowl, beat the eggs briefly until the yolk and whites are mixed and mix them into the chocolate mixture, just until everything is combined. 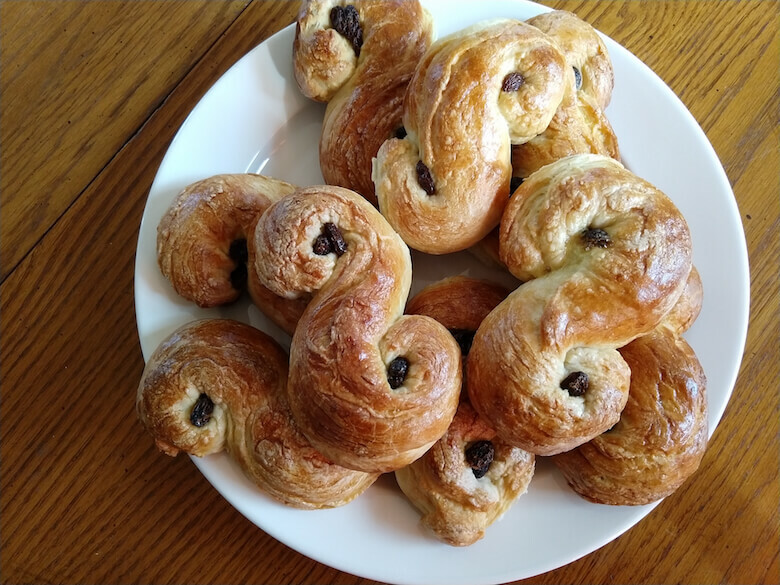 Mix in the baking soda, and then gently fold in the chocolate chips. Spoon into muffin pans (I used parchment liners) and bake at 350 degrees for 12-15 minutes, or until the tops of the muffins are just firm. 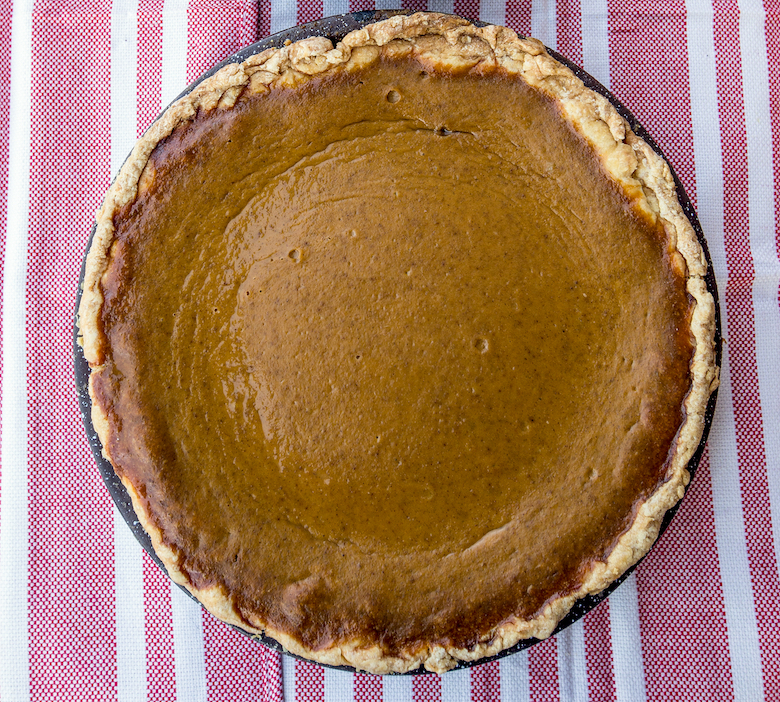 Top with sifted cocoa powder or frost if desired.